Take the regional train/regional express from Cologne or Bonn to Euskirchen and from here take a regional train to Bad Münstereifel. The Tourist Information Office is located directly at the station and can be reached in about 4 minutes by foot upon arrival. Use the highway A61 and take exit 28 "Rheinbach". From here follow signposts to Bad Münstereifel. Once you've arrived, follow the signposts to the railway station. The Tourist Information Office is located in striking distance from the station. Parking is available directly at the station. From the Köln/Bonn airport take the urban railway to Cologne Main Station (Köln Hauptbahnhof). From here take the regional express to Euskirchen and then transfer to a regional train towards Bad Münstereifel. The Tourist Information Office is located directly at the station (4-minute walk). Bad Münstereifel is a small town in the southmost part of North Rhine-Westphalia. Nearly the entire town fortification is completely intact, and beautiful half-timbered houses can be discovered here. Almost 20,000 people currently live in Bad Münstereifel, but during spring and summer, the number of people there skyrockets as the town fills with tourists. Since 1974 Bad Münstereifel has been a spa town. Bad Münstereifel is the first town in Germany where an outlet center will be developed in the historic city center, rather than in the greener outskirts beyond the city limits. Between 30 and 40 brand-name stores will be opened here. Characteristic of the town are the narrow alleys with beautiful half-timbered houses, parts of which are several hundred years old. The almost completely intact town fortification was built in the 13th century and has four city gates- one to the north, east, south and west. You can even discover roman relics from around the 3rd century AD here in Bad Münstereifel. The entire city center is a museum in itself, but there are several museums such as the Apothekenmuseum (drugstore museum), the Holzspielzeugmuseum (wooden toys museum) or the Handwebmuseum (weaving museum) with relics and pictures that tell a story of the over 5,000 year-old tradition of weaving. The "Kurpark Schleid" (spa gardens Schleid) is located just 200 meters from the railway station and is quite easy to walk to. Here you can explore nature on a 2 km loop road with many benches for resting. Here you'll find a biotope, a miniature golf area, an area for water treading, a nature trail and a game reserve with deer and other animals. The "Apothekenmuseum" (drugstore museum) is located in a historic building where a former drugstore operated between 1806 and 1994. After 1994 the facilities were rebuilt for the museum. Here you can find the original salesroom from the year 1806 (in German,"Offizin"). In another chamber there is a "smell street" (in German, Riechstraße) where you can smell different drugs, or medical plants- every visitor is encouraged to interact with the museum. Around Bad Münstereifel there are 12 allotments of primeval forest, and it's possible to hike all of them, or just a few. There are marked hiking trails all around where you can learn a lot about the different stages of the forest as well as the "residents" of the forest, such as birds, insects etc. Visit the Radio Telescope Effelsberg, which is approx. 12 km away. It is one of the largest fully steerable radio telescopes on earth. A beautiful 4-star hotel with modern rooms, a 24-hour reception, and a spa area. It also includes a stylish restaurant in which also the breakfast is served. There is also car parking on site. In regards to the location, it is located just 1.5 KM from the Kölnmesse and the Lanxess Arena, a train connection is in imminent proximity, and the city center is a 10 minute drive distant. This 4-star wellness hotel offers large rooms, free Wi-Fi, and free spa facilities. 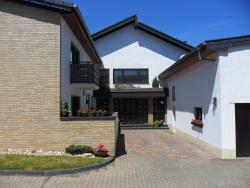 It is in the historic spa town of Bad Münstereifel, a 5-minute walk from the train station. 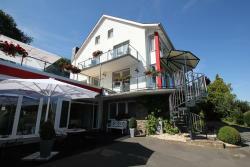 Ferienwohnung Orchidee apartment is situated in the village of Eschweiler, 2 km from the picturesque town of Bad Münstereifel. There is free WiFi at the accommodation, and free parking. Just a 5-minute drive from the A1 motorway, this holiday home includes a garden and a balcony in the tranquil Eifel countryside. The historic town of Bad Münstereifel can be reached by car in 15 minutes.